If you remember back to a few months ago I created a "Day in My Life" post celebrating the launch of the Clearasil Daily Clear, Vitamins & Extracts range. I was also recently featured in the Clearasil "Look Good, Feel Good" book giving my look good and feel good tips. I am now here to share with you all a detailed review giving my thoughts and opinions on the Scrub from the new Vitamins & Extracts range. The primary benefit of a scrub is it's deep cleansing abilities which allow the removal of dead skin, encouraging new skin cell growth for a soft and smooth complexion. 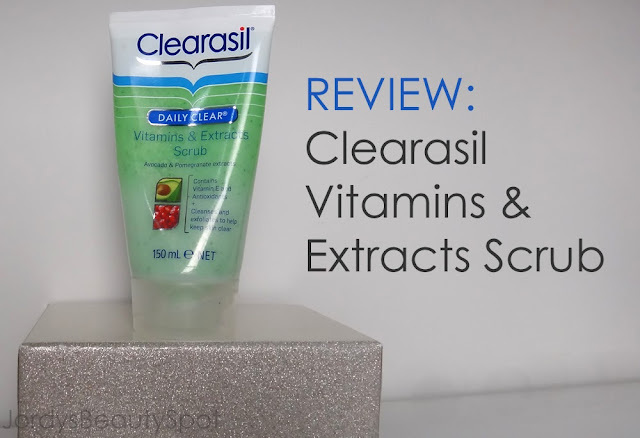 Clearasil has now launched a new scrub to add to their line, this one is of particular interest as it is much more mild than others available and is part of a natural range. Formulation: It has quite a thick consistency with little beads that provide gentle exfoliation. Unlike some other scrubs on the market this one isn't harsh or abrasive on the skin and is much more mild, leaving your skin purified but also moisturised. Directions: Squeeze a small amount into hands, lather and massage gently ensuring you aren't too forceful as this could irritate your skin. Also avoid the delicate under eye area. RInse thoroughly with warm water then pat dry. Effectiveness: The Vitamin E and Avocado extracts nourish the skin while the Pomegranate fruit extracts keep the skin looking healthy thanks to the antioxidants. Usage: This cleanser is gentle enough for every day use and can be made part of your regular skin care routine. Due to the mildness of this scrub, it is also suitable for sensitive or easily irritated skin. Scent: A gorgeous scent that is sure to fill up your shower and is perfect for both morning and evening. Cost and Availability: The price point on this scrub is extremely reasonable ranging between $8-$10. For the quality of this scrub, it is certainly a steal in comparison to others on the market. I definitely recommend picking up this cleanser to try out next time you see it, not only is it a great product but also a bargain considering the price. A must have and great addition to any skin care regimes. * This is a sponsored review.